The Basel Convention on the Control of Transboundary Movements of Hazardous Wastes and their Disposal was adopted on 22 March 1989 and entered into force on 5 May 1992. The management of hazardous wastes has been on the international environmental agenda from the early 1980s, when it was included as one of three priority areas in the United Nations Environment Programme’s (UNEP) first Montevideo Programme on Environmental Law in 1981. The Basel Convention on the Control of Transboundary Movements of Hazardous Wastes and their Disposal (hereinafter referred to as “the Basel Convention”) was adopted in 1989, in response to a public outcry following the discovery, in the 1980s, in Africa and other parts of the developing world of deposits of toxic wastes imported from abroad. Awakening environmental awareness and corresponding tightening of environmental regulations in the industrialized world in the 1970s and 1980s had led to increasing public resistance to the disposal of hazardous wastes – in accordance with what became known as the NIMBY (Not In My Back Yard) syndrome – and to an escalation of disposal costs. This in turn led some operators to seek cheap disposal options for hazardous wastes in Eastern Europe and the developing world, where environmental awareness was much less developed and regulations and enforcement mechanisms were lacking. It was against this background that the Basel Convention was negotiated in the late 1980s, and its thrust at the time of its adoption was to combat the “toxic trade”, as it was termed. It was adopted in 1989 and entered into force in 1992. In June 1987, the Governing Council of UNEP approved the Cairo Guidelines, a non-binding legal instrument, primarily designed to assist governments in the development and implementation of their national management policies for hazardous wastes. At the same time, based on a joint proposal by Switzerland and Hungary, the Governing Council of UNEP mandated the Executive Director to convene a working group with the task of elaborating a global convention on the control of transboundary movements of hazardous wastes, drawing on the Cairo Guidelines and the relevant national, regional and international bodies. The Council also authorized the Executive Director to convene, in early 1989, a diplomatic conference to adopt and sign the convention. This decision and the resulting negotiations were subsequently endorsed by the United Nations General Assembly. The schedule determined by the Governing Council allowed for a period of less than two years for the drafting and negotiation of the convention. The Ad Hoc Working Group of Legal and Technical Experts with a Mandate to Prepare a Global Convention on the Control of Transboundary Movements of Hazardous Wastes (hereinafter referred to as “the Working Group”) began its deliberations at an organizational meeting in October 1987 and held a total of five negotiation sessions between February 1988 and March 1989. The Conference of Plenipotentiaries on the Global Convention on the Control of Transboundary Movements of Hazardous Wastes, convened at the invitation of the Swiss Government from 20 to 22 March 1989 in Basel, and in which 116 States were represented, considered the final draft of the Convention submitted to it by the Working Group. 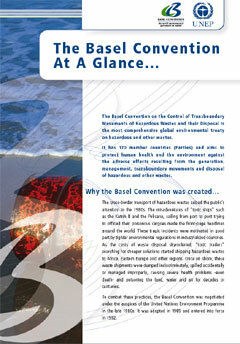 The Basel Convention was adopted unanimously by the Conference on 22 March 1989. The Conference also adopted eight resolutions related to the further development and the implementation of the Basel Convention. One hundred and five States and the European Economic Community (EEC) signed the Final Act of the Basel Conference. On 22 March 1990, when the Basel Convention was closed for signature in accordance with its article 21, fifty-three States and the EEC had signed it. It entered into force on 5 May 1992 upon deposit of the twentieth instrument of accession (article 25).